Bhagat Singh, one of the most influential freedom fighters and revolutionaries, was hanged to death on this day in 1931, along with Sukhdev and Rajguru. They had been charged and convicted in the murder of John Saunders. Bhagat Singh, during his lifetime, had written extensively about issues that are plaguing the nation today. Bhagat Singh saw the ills within the Indian society and how the British exploited it for their own benefit. He stood for communal harmony, for unity among the people of India, he urged people, through his writing, to overcome the socital divisions and to develop a class conscience which, he believed, was the only way he thought India could gain independence from the colonial rule. Bhagat Singh was a staunch atheist and a firm critic of all the religions. He said that the need for God in the society lies in the lack of a scientific understanding of the world and was an advocate of Scientific Socialism. He held a deep understanding of the linkages of religion with the caste system in India. He criticised Hinduism which provides a rationale to the practice of untouchability and caste heirarchy, but he was also equally critical of all religions. On Bhagat Singh Shahadat Divas, the Indian Cultural Forum brings to you excerpts from “Letter to Younger Brother”, “On Gandhism”, “Why I am an Atheist” and “Manifesto of Naujawan Bharat Sabha, Punjab”, because his words are as important now as they were then. While, we Indians, what are we doing? A branch of peepal tree is cut and religious feelings of the Hindus are injured. A corner of a paper idol, tazia, of the idol-breaker Mohammedans is broken, and ‘Allah’ gets enraged, who cannot be satisfied with anything less than the blood of the infidel Hindus. Man ought to be attached more importance than the animals and, yet, here in India, they break each other’s heads in the name of ‘sacred animals’. Our vision is circumscribed by narrow communalism, while the youth of world thinks in terms of internationalism. There are many others among us who hide their lethargy under the garb of internationalism. Asked to serve their country they reply: “Oh Sirs, we are cosmopolitans and believe in universal brotherhood. Let us not quarrel with the British. They are our brothers.” A good idea, a beautiful phrase. But they miss its implication! The doctrine of universal brotherhood demands that the exploitation of man by man and nation by nation must be rendered impossible. Equal opportunity must be offered to all without any sort of distinction. But British rule in India is a direct negation of all these, and we shall have nothing to do with it. Religious superstitions and bigotry are a great hinderance in our progress. They have proved an obstacle in our way and we must do away with them. “The thing that cannot bear free thought must perish.” There are many other such weakness which we are to overcome. The conservativeness and orthodoxy of the Hindus, extra-territorialism and fanaticism of the Mohammedans and narrow-mindedness of all the communities in general are always exploited by the foreign enemy. Young men with revolutionary zeal from all communities are required for the task. Having achieved nothing, being prepared to sacrifice nothing for any achievement; our leaders are fighting amongst themselves to decide what will be the share of each community in the hoped achievement. Simply to conceal their cowardice and lack of spirit of self-sacrifice, they are creating a fog and screening the real issues. These armchair politicians have their eyes set on the handful of bones that may be thrown to them, -as they hope- by the mighty rulers. That is extremely humiliating. Those who come forth to fight the battle of liberty cannot sit and decide first that after so much sacrifices, so much achievement must be sure and so much share to be divided. Such people never make any sort of sacrifice. We want people who may be prepared to fight without hope, without fear and without hesitation, and who may be willing to die unhonoured, unwept and unsung. Without that spirit we will not be able to fight the great two-fold battle that lies before us – two-fold because of the internal foe, on the one hand, and a foreign enemy, on the other. Our real battle is against our own disabilities which are exploited by the enemy and some of our own people for their selfish motives. A short life of struggle with no such magnificent end, shall in itself be the reward if I have the courage to take it in that light. That is all. With no selfish motive, or desire to be awarded here or hereafter, quite disinterestedly have I devoted my life to the cause of independence, because I could not do otherwise. The day we find a great number of men and women with this psychology who cannot devote themselves to anything else than the service of mankind and emancipation of the suffering humanity; that day shall inaugurate the era of liberty. Not to become a king, nor to gain any other rewards here, or in the next birth or after death in paradise, shall they be inspired to challenge the oppressors, exploiters, and tyrants, but to cast off the yoke of serfdom from the neck of humanity and to establish liberty and peace shall they tread this-to their individual selves perilous and to their noble selves the only glorious imaginable-path. Is the pride in their noble cause to be – misinterpreted as vanity? Who dares to utter such an abominable epithet? To him, I say either he is a fool or a knave. Let us forgive him for he can not realize the depth, the emotion, the sentiment and the noble feelings that surge in that heart. His heart is dead as a mere lump of flesh, his eyes are-weak, the evils of other interests having been cast over them. Self-reliance is always liable to be interpreted as vanity. It is sad and miserable but there is no help. You go and oppose the prevailing faith, you go and criticize a hero, a great man, who is generally believed to be above criticism because he is thought to be infallible, the strength of your argument shall force the multitude to decry you as vainglorious. This is due to the mental stagnation, Criticism and independent thinking are the two indispensable qualities of a revolutionary. Because Mahatamaji is great, therefore none should criticize him. Because he has risen above, therefore everything he says-may be in the field of Politics or Religion, Economics or Ethics-is right. Whether you are convinced or not you must say, "Yes, that's true". This mentality does not lead towards progress. It is rather too obviously, reactionary. Any man who stands for progress has to criticize, disbelieve and challenge every item of the old faith. Item by item he has to reason out every nook and corner of the prevailing faith. If after considerable reasoning one is led to believe in any theory or philosophy, his faith is welcomed. His reasoning can be mistaken, wrong, misled and sometimes fallacious. But he is liable to correction because reason is the guiding star of his life. But mere faith and blind faith is dangerous: it dulls the brain, and makes a man reactionary. If, as you believe, there is an almighty, omnipresent, omniscient and omnipotent God-who created the earth or world, please let me know why did he create it ? This world of woes and miseries, a veritable, eternal combination of numberless tragedies: Not a single soul being perfectly satisfied. Pray, don't say that it is His Law: If he is bound by any law, he is not omnipotent. He is another slave like ourselves. Please don't say that it is his enjoyment. Nero burnt one Rome. He killed a very limited number of people. He created very few tragedies, all to his perfect enjoyment. And what is his place in History? By what names do the historians mention him? All the venomous epithets are showered upon him. Pages are blackened with invective diatribes condemning Nero, the tyrant, the heartless, the wicked. One Changezkhan sacrificed a few thousand lives to seek pleasure in it and we hate the very name. Then how are you going to justify your almighty, eternal Nero, who has been, and is still causing numberless tragedies every day, every hour and every minute? How do you think to support his misdoings which surpass those of Changez every single moment? I say why did he create this world – a veritable hell, a place of constant and bitter unrest? Why did the Almighty create man when he had the power not to do it? What is the justification for all this ? Do you say to award the innocent sufferers hereafter and to punish the wrong-doers as well? Well, well: How far shall you justify a man who may dare to inflict wounds upon your body to apply a very soft and soothing liniment upon it afterwards? How far the supporters and organizers of the Gladiator Institution were justified in throwing men before the half starved furious lions to be cared for and well looked after if they could survive and could manage to escape death by the wild beasts? That is why I ask, 'Why did the conscious supreme being created this world and man in it? To seek pleasure? Where then is the difference between him and Nero'? In a sense Gandhism with its counter –revolutionary creed of quietism makes a nearer approach to the revolutionary ideas. For it counts on mass action, though not for the masses alone. They have paved the way for the proletariat revolution by trying to harness them, however crudely and selfishly to its political programme . The Revolutionary must give to the angle of non- violence his due. Use yeh Fikar hai hardam kai naia terje Jafa Kiya hai, Hamai Yeh shauk hai kai dekahain ke sitam ki inteha kya hai. They are ever anxious to devise new forms of treachery, we are eager to see what limits there are to oppression. My Breeze will always be inspiring and my ideas will lightening the path, the self is but a fist full of dust hardly matter whether it lives or dies. 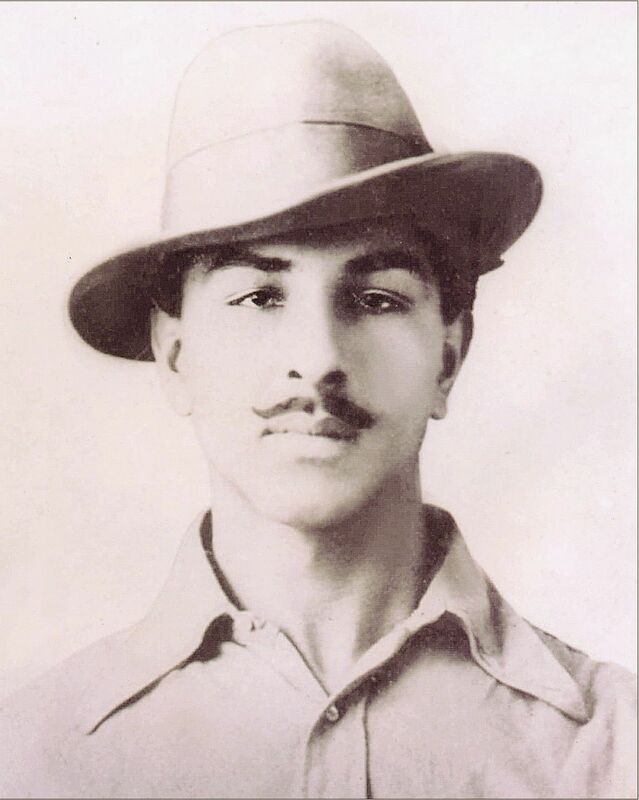 How much does today’s youth know about Bhagat Singh’s ideas? We are grateful to Professor Jagmohan Singh for sharing this material with us.